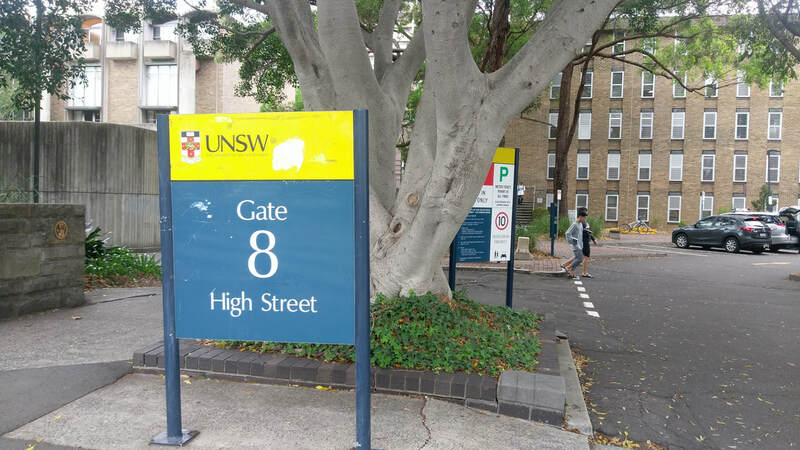 Enter the University of New South Wales at gate 11 off Botany Street. There is currently building work taking place here. Follow the road up gate 11 until you reach the AGSM building (on your left). One of our researchers will meet you here to give you a parking permit and show you where to park. If you arrive early, there is a small pull-in area round the side (where the white van is parked in the picture below) where you can call us to let us know you are here and someone will be down to meet you as soon as possible to meet you. Take the bus to the Gate 8 entrance on High St, and walk up to the Gate 9 entrance outside the Lowy Cancer Research Centre and opposite Wansey Road. A researcher will meet you here and show you in to the building.